Size (inches): 13.39" X 1.97" X 16.54"
First introduced in 1986, the Chimalong is still one of our most popular products. Recommended for its educational value by John Sebastian, Marilyn Horne, Andre Watts, Pete Schickele and the late Jim Henson, it can be played by number, color or notes! 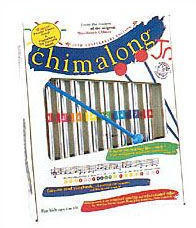 The Chimalong Junior is a great introductory version of the Deluxe model. Extra B-flat tube, two mallets and a full color songbook included. Ages: 3 and up. Made in USA. More Photographs - Chimalong Deluxe Jr.
End of More Photographs - Chimalong Deluxe Jr.